New York City-based artist Eric LoPresti will have a solo exhibition at New Mexico State University Art Gallery, with an opening reception from 6–7:30 p.m. Thursday, Oct. 4. 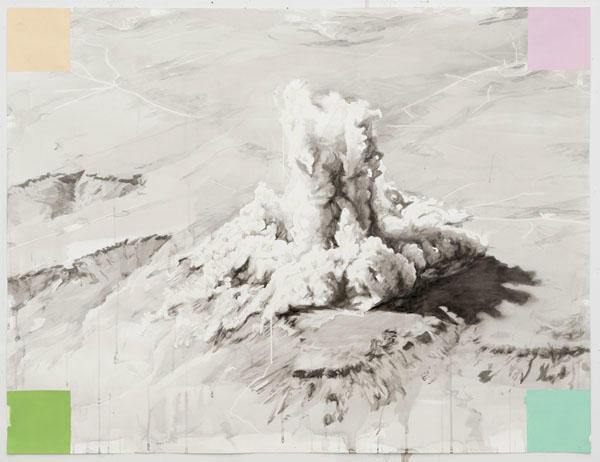 This exhibition examines the complicated effects the Cold War and nuclear testing have had on the Southwest American landscape and the global psyche. Comprised of oil paintings, large-format watercolors, digital works and a multi-channel video (a new medium for the artist), “Superbloom” will be accompanied by a series of performances. The UAG will host two live Aikido performances from 1–2 p.m. on Saturday, Oct. 6 and from 2–3 p.m. Saturday, Dec. 1. A panel discussion, focusing on the complex history of nuclear development in the West and the potential role art can play as a catalyst of change, will also be at 3 p.m. Saturday, Dec. 1. “LoPresti’s oil paintings and watercolors include epic views of gigantic nuclear test sites and the scarred desert landscapes of the American west, counterbalanced by intimate depictions of cacti and desert flowers, symbols of ecology and resilience. The pairing invokes a yin-yang of beauty and destruction, trauma and aesthetics,” said Marisa Sage, director of the University Art Gallery. A full programming calendar including all associated programming and partnership events, workshops and performances are regularly posted on uag.nmsu.edu. This exhibition was partially funded by a grant from the Community Foundation of Southern New Mexico's Devasthali Family Foundation Fund.